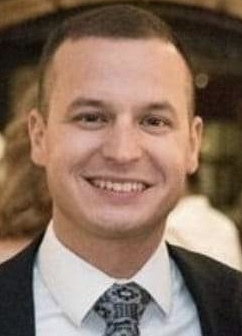 Travis Lee Tridle, age 32, of Cicero, IN, and formerly of Plainfield, IN, passed away February 8, 2019 due to an auto accident near Cicero. He was born January 22, 1987 at Indianapolis, IN to Dennis Edward Tridle and Joann Louise (Mauricio) Tridle. He was a graduate of Plainfield High School with the Class of 2005. Travis was currently working as a plumber with the Tittle Plumbing Company at Cicero, IN. He was a member of the Sons of the American Legion at Cicero, IN. He enjoyed woodworking, hunting, fishing, camping and just being in the outdoors. Leisure time often found him playing his guitar and exercising his dogs. He married Alisa Ann (Hale) Tridle in September of 2018. She survives him. Also surviving are his mother: Joann Tridle of Plainfield, his father: Dennis Tridle of Plainfield, a brother: Nathan Tridle of Plainfield and his furry babies: Bruno and Layla. Memorial services will be held Friday, February 15, 2019 at 12:00 Noon at Hartley Funeral Homes Cicero Chapel, 209 West Jackson Street, Cicero, IN, 46034 with visitation from 10:00 A.M. until time of the services. You may send condolences at http://www.hartleyfuneralhomes.com.